Bus Tour "Crimean Around the World" - excursions all over the Crimea in 6 days with accommodation and meals. The price also includes guide services, entrance fees to museums, transport service during the entire tour. For 6 days you can visit the medieval Genoese fortress in Sudak and Feodosia, the known worldwide Aivazovsky art gallery, visit the extraordinarily beautiful natural surroundings of Crimea, Baydarskaya valley and get to know places of worship of the Stone Age, Skelsky menhirs. 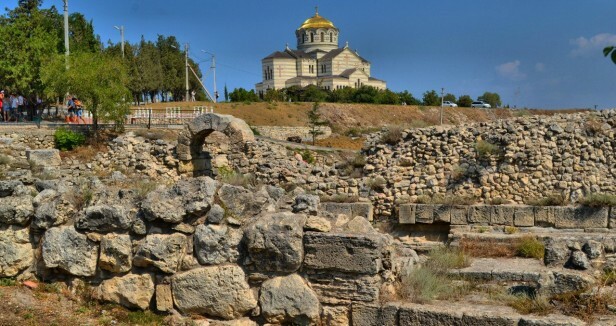 We look forward to an interesting tour at the ruins of the ancient polis Chersonese, a fascinating journey into the medieval Crimea, visit the residence of the Crimean khans in Bakhchisarai and cave town Chufut-kale. 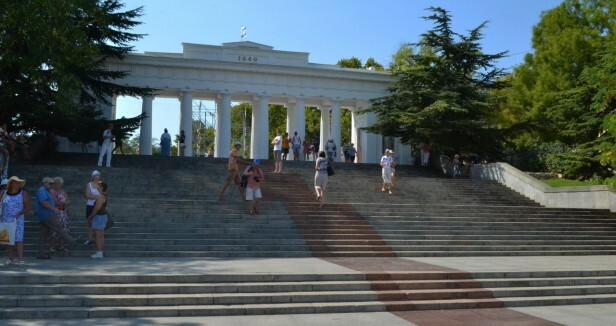 You will get acquainted with the historical monuments of Sevastopol, romantic palaces South shore. 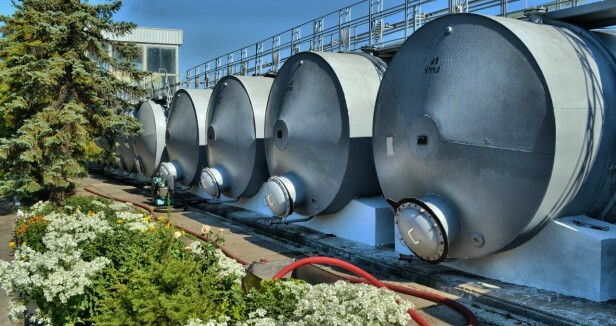 Nobody will be left indifferent during the unforgettable excursion to the top-secret factory for the repair of submarines in Balaklava. This new tour in the program has now become even more convenient. The accommodation in hotels in the cities following the tour, will guarantee not to long journeys, to return to the hotel for the evening . 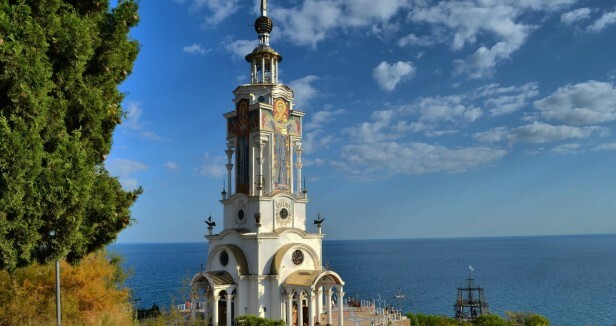 Visit the most interesting places of Crimea in a few days without losing too much time on the movement and organization. Every traveler knows that it is necessary to plan your vacation to the best. Our tour "Crimean Around the World" will do it for you! You will plunge into the wonderful world of the peninsula and become part of the turbulent life of a tourist community. You'll feel right at home thanks to the hospitality and friendliness of local inhabitants of the peninsula. Some people prefer to vacation in their own country, but nothing can surpass the rest in the Crimea for its energy force. It created a unique world for lovers of natural beauty and harmony. Do not be concerned about how to best plan your time for sightseeing and leisure. "Crimean Around the World" was created so to save your time. This is achieved at the expense of the competent planning trips and excursions to the Crimea joined in one great trip. 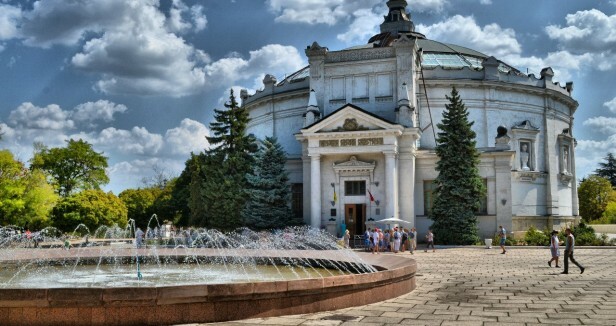 DAY 1 - "Journey into the medieval Crimea"
8.30-9.00 meeting at the railway / train station of Simferopol at the fountain. 9.30-10.00 meeting in Simferopol airport near the exit of the terminal "A"
Transfer to Bakhchisarai where you start with the excursion. Visit the Khan's Palace - the residence of the Crimean khans: palace mosque, the Council and the Court hall, harem, the Fountain of Tears, Golden Fountain, Arabian courtyard, Falcon Tower, Khan's bath. Visit to the archaeological complex "Salachik" - the historic district of Bakhchisaray that housed the first capital of the Crimean Khanate. The property includes renovated Zyndzhirly madrasah (school from the year 1500)., Dyurbe what is the mausoleum of the founders of the Crimean Khanate from the year 1501, The Pantheon, the remains of the khan baths. Optional visit to the Cave city Chufut - Calais: were many caves carved into the utility room, the ruins of the mosque and the mausoleum of the Golden Horde Khan's daughter Tokhtamysh Dzhanyke Khanum 1437 construction. Two kenassas (Karaite temple) and one residential homestead consisting of two buildings. Preserved as many residential buildings as well as not surviving Mint, which minted coins Crimean (optional, adults - 200 children - 100 rubles). Lunch in a local place with a national Tatar cuisine and coffee ceremony. After lunch visit the cave Assumption Monastery in the scenic gorge Maryam - Dere. Founded by Greek monks in VIII- IXv, According to legend, it was on these rocks the people saw the miraculous icon of the Mother of God. Tash-Air - primitive parking. Rock paintings of ancient people. Cave city Kachi-Kalon (briefly). Visit to Inkerman. The fortress and monastery. The medieval fortress Calamita, Cave Monastery of St. Clement. DAY 2 - "Sevastopol - a city of majestic, worthy of worship"
Palatine dock. Vladimir Cathedral with the burial vault of the admirals, A memorial to the defenders of Sevastopol, a monument AI Kazarskyi. "Chersonese" Historical and Archaeological Reserve. The ancient Greek city Chersonese, defensive walls and towers, the ancient theater, the mint, the citadel, houses, medieval churches, the Basilica. Sobor Vladimirsky, Vladimir Cathedral was built on the site of a medieval cruciform church. It was built in honor of Prince Vladimir, which, according to the Russian Chronicles, was baptized in Chersonesos (Korsun). Beach Tour to Balaklava: Embankment, Genoese tower, Church of the Apostles 12, a top-secret underground plant to repair underwater boats briefly) In Balaclava you will enjoy a boat trip on the Balaklava Bay. Balaklava safely be called the capital of boating. Boat trips - the brightest feature of the resort Balaklava, as inseparable from it today as described Kuprin fishermen Listrigony hundred years ago. Return to the hotel (Sevastopol) Dinner. 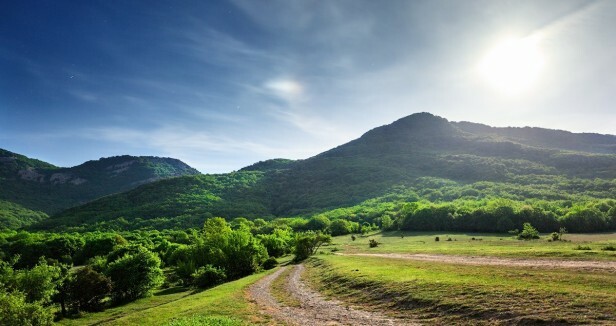 DAY 3 - "Meet the southern coast of Crimea"
First breakfast and then a transfer to the South Coast of Crimea for the tour to see the Bajdarsky Valley. At the bottom of a mountain valley, surrounded by mountains covered with emerald green, it is a real jewel of the mountain area the Bajdarsky picturesque valley. People for centuries settled in this land, also called the Crimean Switzerland. The old Roman road, what is a wide path leaving deep into the forest and climbing higher and higher. It starts at an altitude of 290 meters above sea level and ends at 920 meters. In Foros you visit the Foros Church of the Resurrection. Mountain Cat is a unique monument of nature, a place of power, ancient Taurian settlements, in some places the ruins of the fortress walls and tombs belonging to the VI-II centuries. BC. 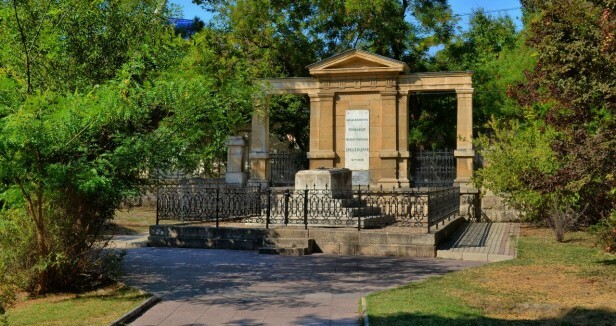 Archaeologists have discovered several graves in the form of stone boxes and is the largest cemetery in the Crimea, referring to the VI-II centuries. BC (from the observation deck). Ascent and descent by the most extensive unsupported cable car in Europe to Mount Ai-Petri. Coral reef, one of the most beautiful peaks of the Crimean Mountains, overlooking the magnificent panorama of the Southern coast of Crimea from the Ayu-Dag Mountain to Cat. Optionally, on the Ai-Petri, you can visit the karst cave "Trёhglazka", the famous teeth Ai-Petri (fossilized coral reefs), the protected beech grove, a café with a national Tatar cuisine, oriental bazaar, ride a horse or camel. After lunch what will be National Crimean Tatar cuisine you visit Mishor. Beach "Mermaid" fountain "Girl Arzy and robber Ali Baba". At the central city beach at Mishor you can admire sculptures by architect Adamson. These sculptures are connected with a famous Crimean legend. The bronze "Rusalka" rises out of the sea with the child in her arms and at the waterfront of Mishor is a fountain "Girl Arzy and robber Ali Baba". Swallow's Nest (from the observation deck). In Yalta you have a walk along the promenade and see the Sea Garden, singing fountains, the temple of Alexander Nevsky, the theater, the Avenue of Stars, Yesenin sycamore, villa "Sophia". DAY 4 - "Palaces and Parks of the South Coast"
Breakfast and then the excursion at the Vorontsov's Palace is one of the most romantic palaces of the South Coast, its state room is the only example now today of the interiors of Russian manors early 19th century (external inspection, optional visiting the palace at will). Walking tour of the palace park: majestic stone chaos, shady grottoes, ponds and lakes, amazing plants and fountains. 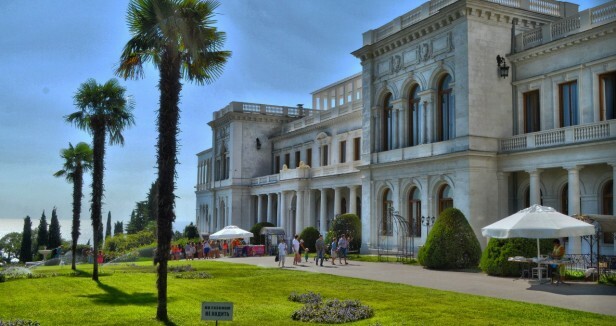 Visiting the Livadia Palace what is former summer residence of the last Russian Emperor Nicholas II. Built in the style of the Italian Renaissance, supplemented by motifs of Byzantine, Arab, Gothic architecture. Italian court yard - the most beautiful corner of the palace. (external inspection, optional visiting the palace at will). Visit to the house church of the Romanov family. 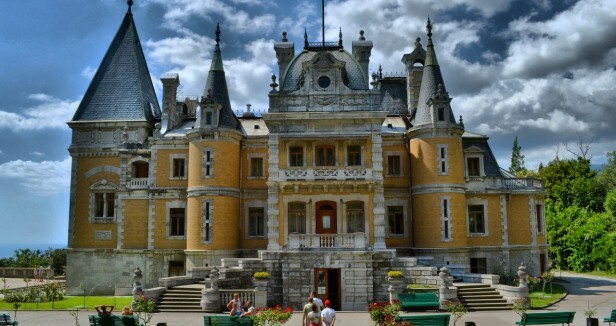 After lunch it is time to visit the Massandra Palace what is a masterpiece of romantic architecture early twentieth century. Surrounded by a magnificent park, passing into the forest, external inspection. (optional visiting the palace). In Gurzuf join a walk around the city. Optional: Chekhov House-Museum, Great park - Art Ayvazovskoe , which shows the best gardens of the world: Greek, Japanese, Mexican, Romantic, Modern. Unique Beach Temple-Lighthouse in with Malorechenskoe , built in honor of all those who died in the waters and consecrated in honor of St. Nicholas. Valley of ghosts - natural sculptures on the west slope of Mount Demerdzhi affecting its size and contours (briefly). Film location in many Russian movies. Transfer to East Crimea. Hotel accommodation (Eastern Crimea). Dinner. 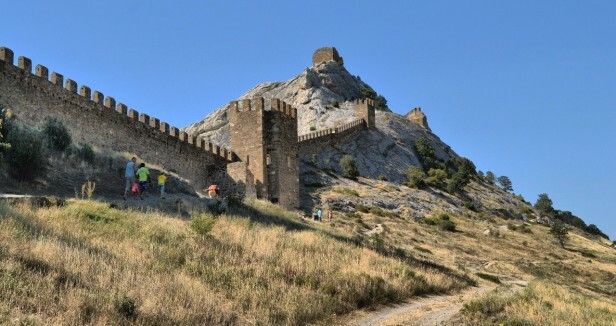 DAY 5 - "Cimmeria - music special frets"
After breakfast you start the excursion with a sightseeing tour of Sudak, visit the Genoese fortress what is a powerful fortification, located on an ancient coral reef, is a conical mountain. New World: a walk around the city. Optional: trail Golitsyn, Chaliapin the famous grotto, carved into the rock. Fiodosia: Armenian and Greek Churches, the Turkish Mosque, Genoese fortress, grave Aivazovsky, Aivazovsky fountain, crypt Aivazovsky. Lunch. Aivazovsky Art Gallery this is a unique, world-famous museum seascape painting. Here on the preservation it is only in its entirety collection of paintings devoted to the marine theme (about 12 thousand pieces). Sightseeing tour of Koktebel. Optional - Boat trip along the extinct volcano Karadag with a swim in the open sea at the Golden Gate. Bay carnelian, Robber, Border, locks with spiers, rocks Lion, Elephant, Lighthouse. Relax on the beach. Voloshin's House Museum visit optional. Return to the hotel (Eastern Crimea). Dinner. DAY 6 - "The holy springs and monasteries of the Eastern Crimea"
Breakfast. Excursion on the Plateau Uzun-Sirt. The place where was held the All-Union competition glider, which became later the traditional (briefly). 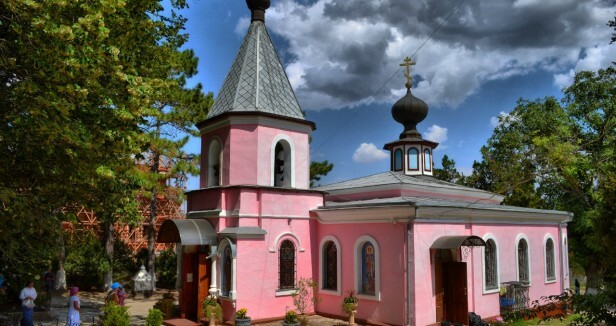 Female Toplovsky monastery of St.. Paraskeva . The healing springs of St. Paraskeva, St George, Three Saints, -.. Water that cure diseases of the eye and head, as well as the musculoskeletal system. Cave St. Paraskeva. Collegiate font. Lunch. Armenian Monastery of Surb Khach. White Rock or Ak-Kaya - the one and only rock in the Crimea and beyond. "Participant" many well-known Soviet feature films "A Man from Boulevard des Capucines", "The Headless Horseman", "Mirage", "A Captain at Fifteen", "business people", "Lobo", "General Lukacs," "Mustang pacer" and even the "Chipollino". Wolf grotto. "Suvorov oak" (briefly). 16.30 -18.00 - Arrival at the railway / train station in Simferopol. 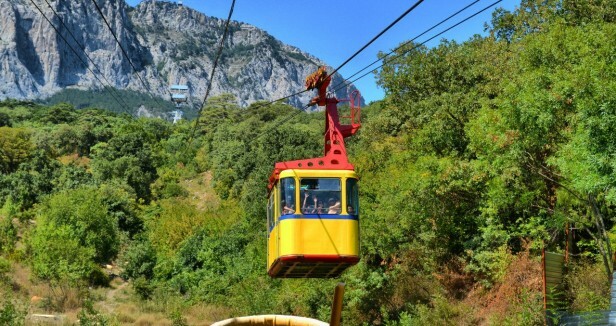 Optionally, on the Ai-Petri, you can visit the karst cave "Trёhglazka" (150 Ruble), the famous teeth Ai-Petri (fossilized coral reefs) (60 rubles), the protected beech grove, a café with a national Tatar cuisine, oriental bazaar, ride a horse or camel. 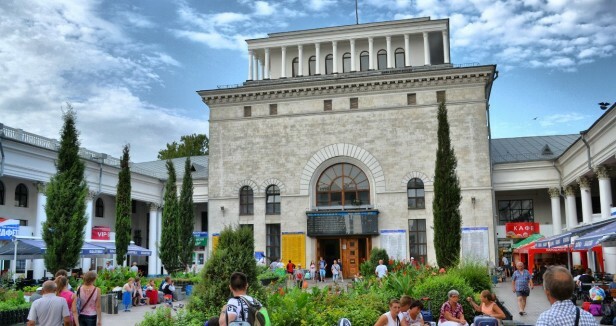 Optional: Chekhov House-Museum (adults - 200, children - 100 Ruble) Great park - Art Ayvazovskoe , which shows the best gardens of the world: Greek, Japanese, Mexican, Romantic, Modern. Koktebel boat trip (600/300 Ruble) along the extinct volcano Karadag with a swim in the open sea at the Golden Gate. Bay carnelian, Robber, Border, locks with spiers, rocks Lion, Elephant, Lighthouse. 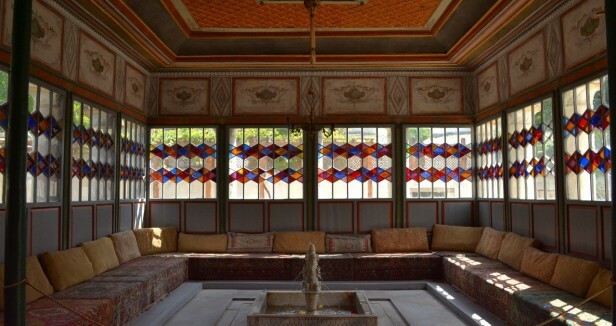 Koktebel Voloshin's House Museum (visit optional, adults - 200 children - 100 Ruble). It is possible to stay more days at Crimea. We like to help you to accomplice this. The price on the program is calculated on the basis of the tour items included. Please note that our luxury tours have the following starting prices in Euro per person. IMPORTANT! TOUR STARTS IN GROUP AT LEAST 10 PEOPLE!